• Yu Darvish is headed back to the DL with shoulder and neck tightness. Darvish had made just three starts in his return from Tommy John surgery before beginning to feel the discomfort. He left his most recent start, on Wednesday, after five innings and continued to experience tightness over the weekend in Seattle. I am not surprised to see Darvish back on the DL. It seems like most pitchers coming back from TJS initially struggle to stay healthy. • Gerrit Cole says his arm doesn’t feel right. The right-handed ace said he isn’t dealing with pain, but rather a different “feel” after leaving in the third inning of Friday’s 9-3 loss to the Cardinals. Cole had put together a 5-4 record with a 2.77 ERA prior to the setback. His return time frame is tough to get a read on because of the injury’s vagueness. I could see him back in 15 days or it could be months. Hopefully, we will find out more over the next few days. • David Wright’s season is over since he has decided to have surgery on his neck. Wright, 33, was scheduled to undergo the surgery Thursday in Marina Del Rey, Calif. Dr. Robert Watkins, the back specialist who coordinated Wright’s rehab from spinal stenosis last summer, was to perform the surgery. The decision to proceed with the operation was made after weeks of tests, rest and anti-inflammatory injections to alleviate pain and improve his mobility, the Mets said. Herniated-disc surgery typically carries a minimum three-month recovery period. If it indeed ends Wright’s season, he will have played in 37 games — one fewer than last year, when his diagnosis of spinal stenosis triggered a three-month rehab process. Wright returned last August and played into the postseason, and hoped to appear in roughly three out of every four games this season. But Wright’s neck began bothering him late last month, and after trying both oral anti-inflammatory medication and an injection, he landed on the disabled list on June 3. Some reports have a chance of him returning in 2016, but if I had him in a redraft league, I would drop him now. • Matt Cain came off the DL from a strained hamstring and then went immediately back on the DL for the same injury. • Sean Manaea is on the DL with a strained forearm and the injury doesn’t seem to involve his UCL. • Gerardo Parra is on the DL with a sprained ankle and will probably miss more than the minimum 15 days. An MRI Wednesday revealed that Parra suffered a high ankle sprain — not a fun injury, but it could have been worse — and he was placed in a walking boot. Parra will go on the 15-day disabled list, and most likely will be out more than the minimum amount of time. • Jonathan Papelbon will be out with an intercostal strain. “Well, obviously you don’t ever want to go on the disabled list,” Papelbon said. “I’ve never been on the disabled list. I’ve taken a lot of pride in never being on the disabled list. I think in my situation here, we gotta make the smart decision. It’s early in the season. There’s no rea-son to push anything right now, I believe. • Just as I was putting my finishing touches on this article, new broke of Steven Souza Jr. going on the DL with a strained hip. He dove for a ball in right field in the seventh inning of an 8-7 win, but he fell back to the turf as he tried to get up. The club waited until Thursday to make the move official to see if his condition improved. X-rays came back negative. • Vance Worley is now on the DL with a strained groin. • Jordan Pacheco will be out with shoulder tendinitis. • Looks like Chad Billingsley believes his career as a pitcher is over. “I can throw a baseball at 50 to 60 percent, but when I ramp it up it starts hurting,” the former Bulldog said. “You’re gone seven to eight months a year traveling out of a suitcase,” Billingsley said of baseball as a career. “Right now I’m mentally happy what I’m doing. I remember back when he was a bigger prospect than Kershaw as both got to the majors around the same time. • Chris Rusin, who is supposedly a Rockies reliever, was placed on the DL with a strained shoulder. 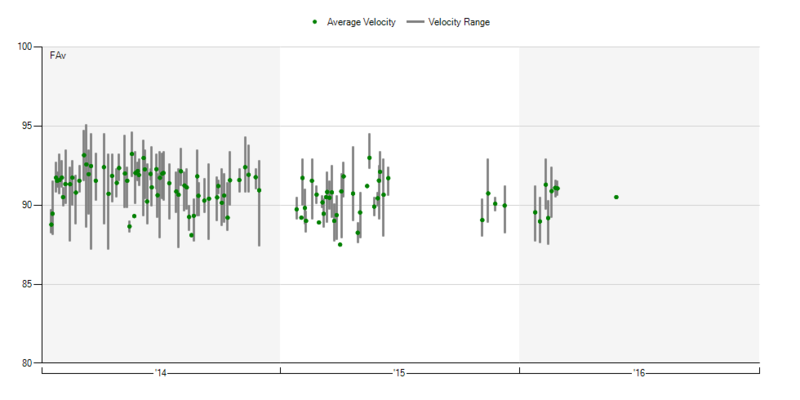 • Matt Belisle average fastball velocity is fine. 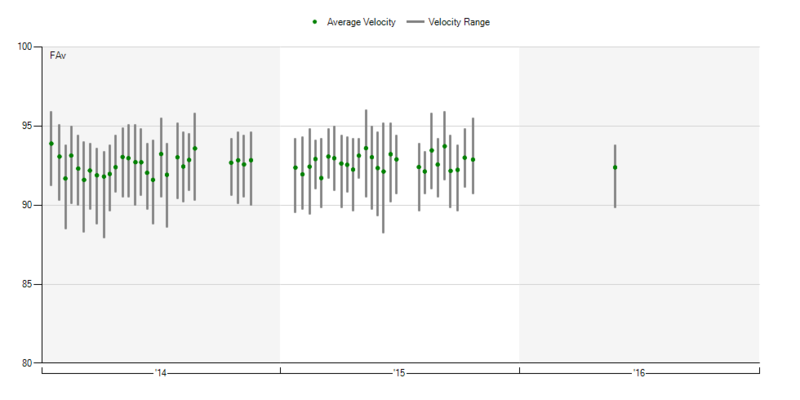 • Matt Garza’s velocity is fine. We hoped you liked reading MASH Report (6/16/16) by Jeff Zimmerman! A look into the new Marlins Park dimensions. What’s the deal with Sergio Romo? Played catch June 5 and the report was that he could be activated that week then no news. Transfer to 60 day DL was billed as a “clerical” move and he would be activated soon but still haven’t seen anything.